CART Your Cart is Empty! Place your order below. We also sell on AMAZON and WALMART. Price: $49.90 per pack. Contains 2 boxes. Price: $185.00 per pack. Contains 8 boxes. Same business day shipping for orders placed before 3pm CST. We accept payments with Paypal, Visa, Mastercard, American Express, and Discover. 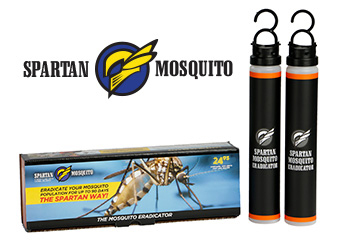 Spartan Mosquito Eradicators are not currently available in South Dakota, Connecticut, or New Mexico. Click Here to find out how many you need! 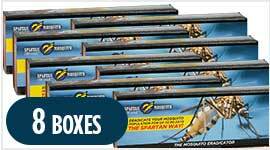 If you are placing your Spartan Mosquito Eradicators at the beginning of mosquito season, you should use one box (two Eradicators per box) per acre. 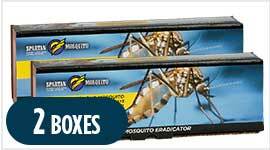 If mosquito season has already started when you place your Spartan Mosquito Eradicators, double up to catch up by using two boxes of two Eradicators each per acre. After the first deployment period of up to 90 days, the mosquito population should be diminished, and you can use one box per acre for the following deployment periods of up to 90 days. 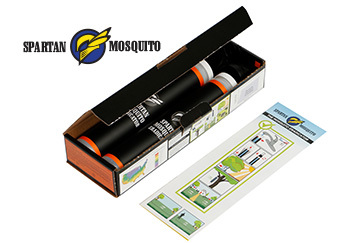 Ideal deployment time for the Spartan Mosquito Eradicator is based on weather, but a good rule of thumb is to deploy them after the “first bite” of the mosquito season. If you deploy them later, when mosquitoes are established, you should double the number of Spartan Mosquito Eradicators to catch up. 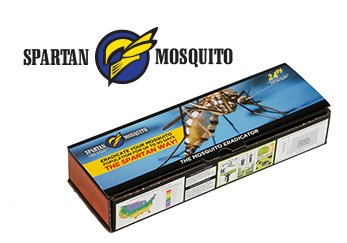 Remove Spartan Mosquito Eradicators from the box. For each Eradicator, remove the temporary white cap and fill with WARM water to the fill line indicated on the back of the Eradicator. Replace white cap. SHAKE THOROUGHLY. Remove white cap. Attach hooks to black caps for hanging, and secure black caps to the top of the Spartan Mosquito Eradicators. Hang Spartan Mosquito Eradicators along the perimeter / property line of the area to be protected, no more than 180 feet apart. If the property is smaller than one square acre, and there are no major mosquito attractors such as a wooded area or a water feature, hang the Eradicators on opposite corners of the property. Be sure to hang the Eradicators away from areas where people gather, since mosquitoes will gather near the Spartan Mosquito Eradicators to feed. If you have woods, heavy vegetation, or a water feature that attracts mosquitoes, you should hang at least one Spartan Mosquito Eradicator near or within that area, away from people. The ideal height to hang the Spartan Mosquito Eradicator is about six feet above the ground. The ideal place to hang Spartan Mosquito Eradicators is in a tree against the trunk on a sturdy branch, or just inside a bush, where they will be shaded and be partially protected from rain. This prevents evaporation and allows some water replenishment from rain. With proper placement, the mosquito population in the area will diminish by 95% in 15 days or less. If the Spartan Mosquito Eradicators are placed after the mosquito population has become established, it may take a little more time to bring the population under control. Use two boxes per acre for the first deployment if the mosquito population is established.